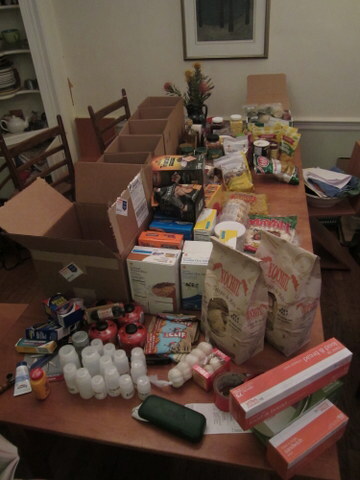 Hikers obsess about equipment and food. Napoleon supposedly said that an army marches on its stomach (if he had applied that lesson, he might have avoided his disastrous Russian campaign), and the equation between miles traveled, weight carried and food consumed becomes quite apparent after a few days on the trail. I encountered Southbound (sobo) LT through-hikers (at lunch at Kid Gore shelter, on my third day) who had accelerated to 20+ mile days in the gentler southern section and were planning to finish off with a 27 (!!) mile day to complete the entire trail in 17 days. They were near to starving and grateful for my extra Ritz crackers. My daughters’ various summer experiences had left us with an attic full of serviceable if not state-of-the-art camping equipment, and I planned to use as much of that as possible in order to avoid an excessive buying spree. I did spring for new boots, opting for heavy-duty (and waterproof) ones in an effort to shore up my aging ankles and knees. I would go as light as I could while trying to maintain some semblance of warmth, dryness, varied diet, cleanliness and general good living while on the trail. I felt there would be enough self-denial involved in merely completing the journey with what I could carry on my back, and didn’t feel prepared to go the ultra-light route. During the first part of the trip, I encountered many nobo AT hikers; many more people complete the more-famous AT then do the LT, and most head north. These folks were the source of a great deal of trail wisdom, since they had been out in the woods for more than 1500 miles by the time they reached Vermont, and had honed their packs and bodies for maximum efficiency. They tended to stream past me in a blur, traveling at speeds well in excess of my red line. I yelled out to one with a tiny pack as he passed: “what do I have to give up to make my pack as light as yours?” and he proudly explained that he had no tent, no stove, and no sleeping bag (he slept under a lightweight blanket). General fatigue and pack sores made me eager to lighten my load, but I wasn’t prepared to subsist on cold food, or shiver through cold nights just to travel faster and easier. Before leaving, I had decided to supply myself with food using post office mail drops. I had fixed my timeline at 24 days based on the amount of time left in my sabbatical, decided that I could achieve the 11 mile-per-day average that would represent, and spaced the mail drops out at even mileage intervals along the trail. I ordered a bunch of dehydrated vegetables (mail order from Harmony House, which I highly recommend), and put together a rough menu for the entire trip. My basic plan was to supply myself with a set of starches, vegetables and proteins (meat, cheese, fish, beans) that I could mix and match on the trail, supplemented with spices, oils, sweets and snacks. For the morbidly curious, here are gory details. Most hikers I encountered chose to shop as they went, going into town and buying what they needed: this is a more flexible system, but somewhat less efficient, and I was concerned it would slow me down too much if I needed to shop along the way. With hindsight, I’m not sure this was a valid concern since I tended to have short days wrapped around my town visits anyway, but it was what I decided to do and it had all the advantages and drawbacks of clockwork predictability. One thing it did was to force me on to a fairly rigid schedule that would prove more and more challenging to keep as I entered the generally rougher and steeper northern section of the trail, but I did complete the trail on the planned schedule, and perhaps the regimentation helped. 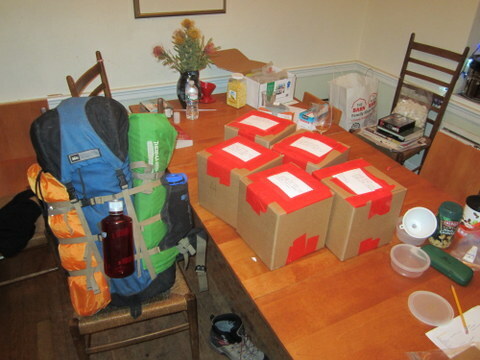 I packed all my supplies in five 8x8x8 boxes and shipped them to post offices evenly spaced along the route. Probably my best meals were a chili made at different times with hard salami or beef jerky, a lentil/vegetable stew, and simple pasta-and-cheese. Par-boiled brown rice, polenta, and pasta filled out these meals which were on the whole filling and tasty. I found I didn’t experience the extreme food cravings that many hikers do. I did eat fresh fruit at every opportunity, and I discovered I did miss having eggs. I had a few food miscues: instant mashed potatoes, a staple for many, just wouldn’t go down, and I carried a lot of peanut butter that I mostly didn’t eat, preferring the roasted, salted almonds, cashews, brazil nuts and peanuts in their un-macerated forms. My one attempt at “baking” – a chocolate cake concoction made with Bisquick – utterly failed to rise to the occasion, developing into a layer of burnt stuff underlying some inedible chocolatey goo. Even with my flexible propane stove (which could simmer) I was unable to achieve the kind of even heat distribution required for this overambitious culinary feat, and was forced to bury the misbegotten result – the only time I didn’t pack out my trash, and perhaps the source of some bad trail karma (hikers have their own peculiar superstitions, but more about that later). 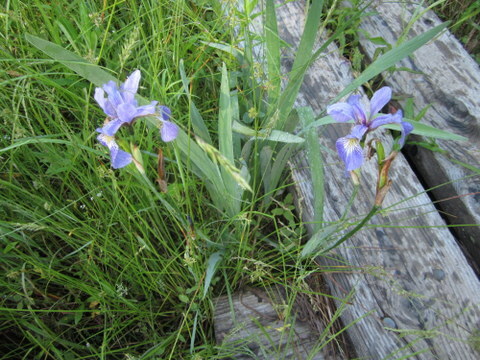 My trek began June 20, a perfect cool sunny late spring day. My eldest daughter dropped me in North Adams at a footbridge where the AT crossed the Hoosic River. 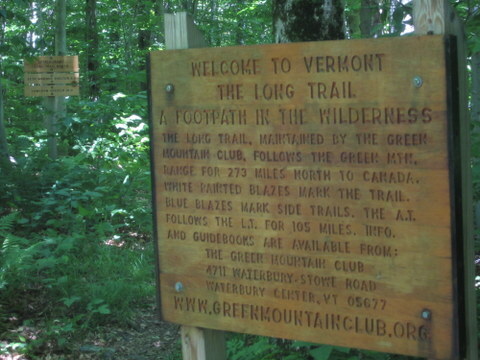 After an initial climb I reached the start of the Long Trail at the Vermont border in the middle of the woods. The LT is peppered with shelters, and hikers tend to stay at them even when tenting elsewhere is possible, if only because they are generally near good water sources and provide outhouses. I arrived at the first one, Seth Warner, and faced the first of many similar decisions: stop at 2:30, or push on to the next shelter? I didn’t feel particularly strong at this point, but it seemed early to stop on my first day, and somehow I didn’t like the looks of Seth Warner, so on to Congdon I went, arriving at 7, quite late to get started with cooking and so on given that darkness fell by 9. 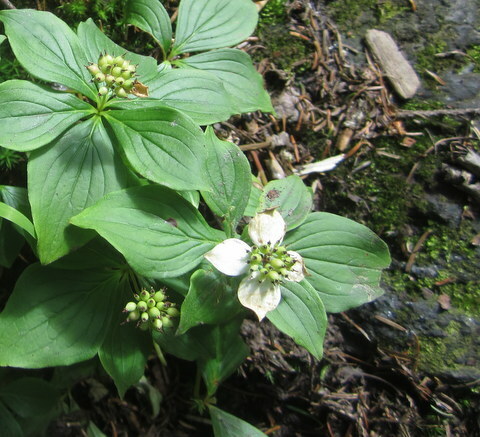 I set up my tent in an inauspicious location near the outhouse, cooked a hasty meal and settled into bed wracked by leg spasms and bothered by a never-seen nocturnal creature that padded, quick-footed, in circles around my tent. While at Congdon, I met a married couple of long-haul AT hikers, Mango and Sunshine, that I was to cross paths with for the next few days. They had met while he was in the Philippines with the Peace Corps in the sixties, and they were now spending their retirement tramping, although, in a pattern I was to see repeated among many hiker couples, he seemed to be much more eager than she was. I think Sunshine would have preferred a visit with her newborn first grandchild to an extended stay in the woods. The next day was another long one – for me any day that exceeded my 11 mile average was “long,” but my journal notes that this one was especially tiring. It involved an extended trek through a largely featureless wilderness – this kind of walk tended to be a bit demoralizing since the dearth of landmarks gave the feeling of an endless stretch of green in which it was impossible to get any real sense of progress. 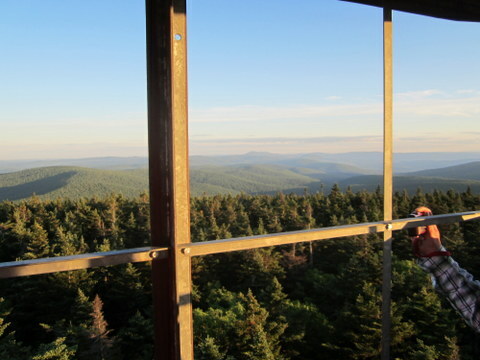 However the day ended with a glorious sunset seen from the top of a fire tower on Glastenbury Mt. The sky was so clear on this longest day of the year, we felt we could see the White mountains in NH and the Adirondacks in NY. Whether this was truly possible I don’t know, but the view was vast and inspiring. 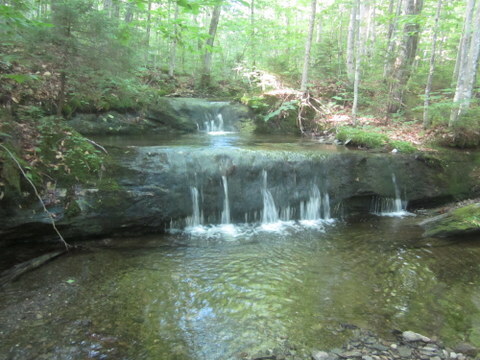 I took a shorter day, hoping to rest a bit and camped by Black Brook. My idea was to get as close to Stratton Mt. as possible, and to leave climbing it for the next day. 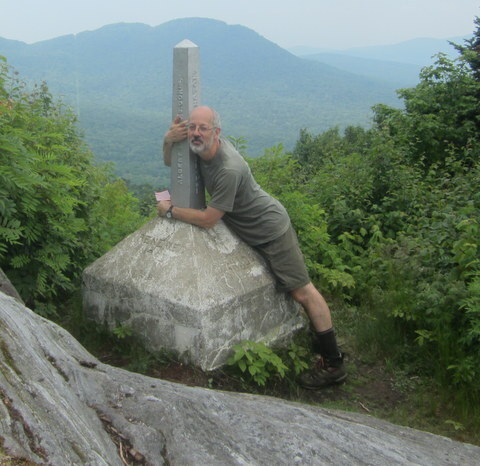 The most notable part of this day was lunch at Story Spring Shelter with Mango, Sunshine, a couple of young women I had met the night before who were hiking the Vermont section of the AT, and a young couple of sobo LT hikers who were planning a 27 mile day (!) to wrap up their 17-day trek. They seemed a bit emaciated and famished as well; she devoured a stack of Ritz crackers I shared with her in short order. 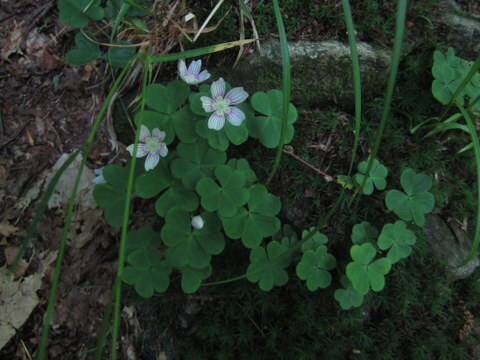 These were the first other LT through-hikers I met. When I asked them if their toes were numb, as mine were beginning to be, they said they had pretty much been numb the whole time. I was beginning to worry about my feet: in addition to the numbness, I was developing a blister on my right heel. 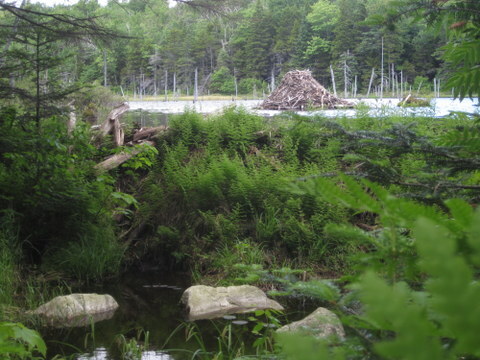 Everyone seemed to remark this astounding beaver dam that held its pond three feet above the level of the trail. I think it was just north of Kid Gore shelter? 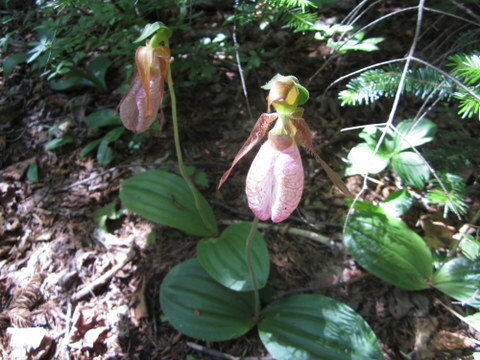 And further down the trail, orchids! Stratton Mt. 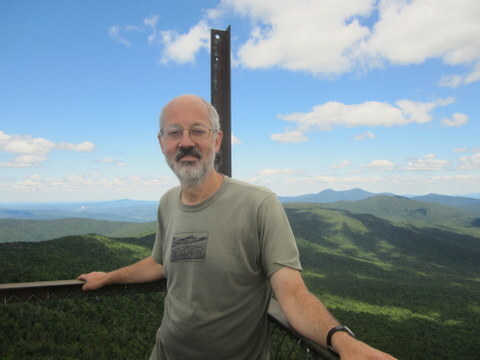 is remarkable for its fire tower view, but I mostly remember its hospitable caretakers, Jeanne and Hugh Joudry, who, as I learned later, have tended the peak of Stratton for decades. Jeanne chatted amiably with me for a few minutes, and Hugh showed up a bit later, apparently returning from a morning walk. 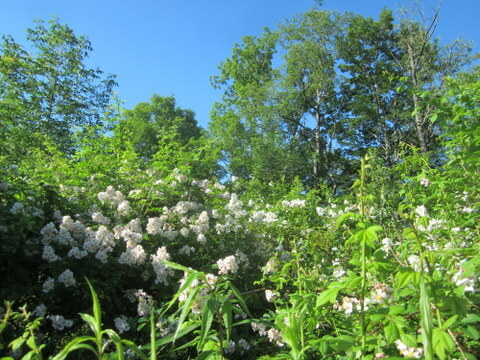 I had started my walk early in the spring, and most of the Green Mountain Club’s caretakers wouldn’t appear for another week or so, but apparently the Joudrys like to get an early jump on the summer, which is beautiful in Vermont, but brief. 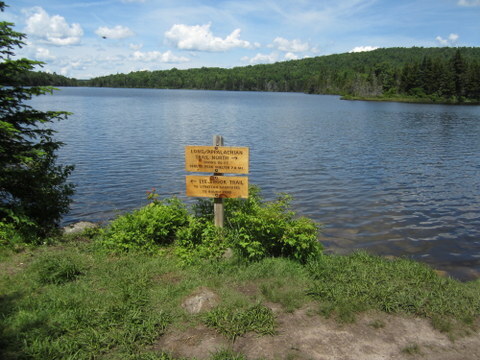 At the foot of the mountain lies Stratton Pond, probably the only place you can really swim on the Long Trail. The pond is deep and cool, and I cried tears of joy as I lay drying in the sun after swimming during a blissful lunchtime alone there on that perfect June day. I kept a journal throughout the walk. For the most part it’s a simple record of miles traveled, shelters stopped at, and people met, but occasionally it ranges into deeper philosophizing. Why did I keep it? I’m not a journal-keeper ordinarily, but somehow my whole life became much more ritualized and structured on the trail. Frankly it was just something to do during the idle time in the evening. Most days followed a similar shape: up at dawn, make breakfast, clean up after breakfast, poop in the outhouse, pack, be on the trail by around 7 or 7:30. Spend all day walking with short breaks for air, longer ones for water, a couple of snack breaks, ideally at some sort of viewpoint out of the endless tree cover, and a long break in the middle of the day for lunch, often at a shelter. Take off boots at lunch to air out feet and socks and try to chafe some feeling back into feet that were getting increasingly numb. Stop at most shelters to read the logbook for news of other travelers and leave a brief note for them to read. Stumble into camp weary after a long day, ideally by 4:30, but occasionally earlier and a few times not until near 6 or even 7. On an early day, do some washing of clothes and self. On most days just hang up sweaty wet clothes in whatever sun remains, change into dry camp clothes, fetch water, maybe wood for a fire. Chat with whomever might be in the shelter or just stretch and rest until around 6. Make dinner, clean up, hang everything out of reach of real mice and theoretical bears, write in the journal, read a few pages of Pilgrim’s Progress and go to bed around 9 as darkness falls. Get up three or four times at night, stumble into the woods to pee in the dark, go back to sleep, and in the morning, start all over again. At first, in the grey light, I didn’t recognize the scale of this weirdly wonderful spot, and simply took the opportunity to stop at a large boulder – always an attractive resting place amid the unending green – to put on cover my pack against the looming rain. Slowly the odd shapes came into focus in the mist and I explored this little diversion. That day was significant for two other reasons. As the rain began to fall in earnest, the steep rocky trail became more slippery than ever, and on my way into Greenwall Shelter I slipped and felt a sharp pain in my left ankle – a fairly mild sprain, but one that would dog me for most of the rest of the trip: better in the morning with naproxen, worse in the evening after a day of pounding, feeding a gnawing doubt I would actually be able to complete the trip. I think it was actually this injury that made me aware just how important it had become to me to walk the whole way. Rationally I knew that completing the trail was an arbitrary goal, and that if I were to be forced off of it by injury, it wouldn’t reflect badly on me in any significant way. But then I also knew that no amount of rationalization could erase the stink of failure. Later at Sunrise Shelter I met a girls’ camp counselor who recounted having to leave the AT, nine-tenths done, after falling in camp and breaking a bone in her foot. The disappointment she felt was palpable; she described the walk out to the road after the injury as the hardest four miles she ever walked, and I think only part of that was due to the excruciating pain she must have felt hobbling on a broken foot. How could one avoid feeling some kind of self-recrimination for even the most blame-free accident? The other thing I remember about day six was that it was the day I met Tortise [sic]. Days were spent alone for the most part: it was not uncommon to walk for hours without seeing anybody, but generally at the shelters: at lunch, at and at night, one would meet other hikers. I think I met only eleven northbound LT through hikers: these were the most significant people for me, since they were following the same route, and if we traveled similar distances, we might become companionable. Tortise and her mother were in the shelter when I arrived, dripping wet, and generously made room for me and the wet spot I created there. There was another couple present as well, a pair of lovebirds who had met in Georgia and remained together all the way along the AT, but to our astonishment they chose to head out into the strengthening storm, pushing on to the next shelter I suppose, in spite of the young woman’s obvious reluctance. Tortise wasn’t the first northbound LT thru-hiker I met – that was Cliff, named for the postal worker on Cheers – but over the next ten days or so, my path and Tortise’s often overlapped. As well as her mother, I met her father, and her dog, and the family were welcome companions: we shared some food, and helped each other out in various small ways, although I think I was mostly the recipient of their charity. Eventually my fixed schedule forced me over Camel’s Hump on a sodden sunless day: a day that I was afraid might break me given the state of my ankle at the time, but Tortise could afford to wait for better weather, and I never saw her again after that, but I feel certain she will have finished, since she was very determined, and strong. 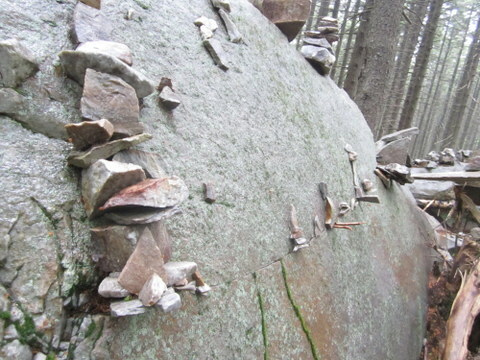 This eventuality made me aware of a strange asymmetry on the trail: the log entries made it possible to track the progress of those ahead, but one never knew what had happened to those one left behind. For those I knew on the trail, this document may represent a strange kind of message from beyond the grave, since the end of the trail is the end of a kind of life, and I hope to read their stories as well. The life we all would eventually return to took on the character in my mind of an afterlife – a land of fresh fruit and laundry in which suffering and toil would be distant memories. This kind of analogy helped me to make sense of Bunyan, too. It was pure whim, and the title, that made me bring Bunyan’s great work, The Pilgrim’s Progress, as my trail reading, but I found it to be a pertinent companion, even if it took a little work to see that. I wasn’t on Christian’s pilgrimage exactly, but there were enough points of contact to draw me in. Such basic themes as the existence of one true path to be followed, losing one’s way, returning to retrieve forgotten equipment, overcoming peril, encountering people with different ideas about where to go and how to get there, the temptation of shortcuts, and even the apposite naming of characters: it was easy to associate these with my own journey. The basic structure of the pilgrimage became so familiar to me that I was able (mostly) to bear up under the alien reformation-era religious disputation, and attempted to extract what spiritual guidance I could from it. The best example for me was the passage in which the Interpreter makes use of the figures of Patience and Passion to put forth his argument for the superiority of the unapprehended afterlife to the present one, a basic religious tenet I had always found highly dubious. The Interpreter contrasts Passion’s taking present pleasures with the delayed gratification that Patience expects, and finds the deferred pleasure superior since it has no end, while the present is soon past and forgotten. Bunyan’s afterlife might simply be my Future, I thought. I saw many of these; at first I thought they were Queen Anne’s Lace, but they are not. Then I thought perhaps Poison Hemlock, but the broad, spiky leaves don’t look like those in the pictures I’ve seen. Long-haul hikers almost all adopt trail names. 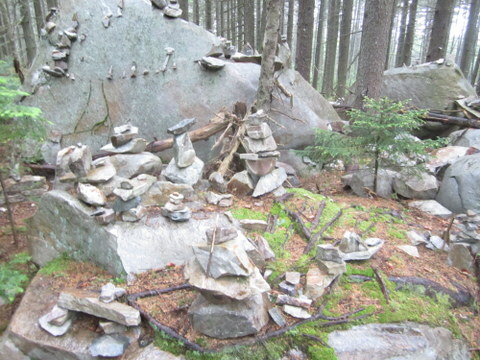 I think the practice originated on the AT, where hikers travel for months at a time and have a more fully-developed trail culture, but LT hikers do it too. These names are arrived at in different ways: some are given, and accepted; some are simply taken, and some are given without consent, although that is rare: I think in my experience only the Stoner Boys were so named: I’m not sure they ever knew what we were calling them, but I only actually saw them at one shelter, but stories about them came up on several different occasions. I took my name, Sparky. I got the sense that AT hikers named each other, but in the early days I just didn’t think anybody knew me well enough to give me a name, and there was a certain amount of pressure to have one: for the logbooks, and to satisfy the curiosity of the AT hikers. I think most of the LT hikers I met made up their own names, and it added to the separation of trail life from “real” life, something that I think many people had as an explicit if unstated goal. After the AT hikers turned right, heading for New Hampshire, the LT became much quieter. That night I stayed at Rolston Rest, where I met Little Sister. An aspiring outdoor educator, she was full of hiking advice. This was always delivered obliquely – people put too much stuff in their pack brains, or tend to leave their stuff scattered around the shelter, and so on, but I got the message! She saved me many miles of weary walking one day when I dropped a sneaker – my valuable camp shoe – at a rest stop, not having tied it securely to my pack. I was preparing to retrace my steps looking for it, when she came tromping along and handed it to me – phew! I think we both became concerned about the increasing difficulty of the walking at that point – the section north of Rolston looks pretty level on the map, but involves a lot of clambering over roots and rocks and generally begins to indicate the rougher terrain that prevails in the North. I ended up moving ahead as she took a break at Middlebury Gap, and never saw her after that, but her tales about other hikers she had met – Moose Hunter and Town Dude in particular – propelled me forward with curiosity, and I hope she finished the trail in spite of, or maybe because of, her sometimes leisurely pace, since she had a real determination to do it, not to mention her entire family rooting for her. More of the not-Queen Anne’s Lace. Occasionally we would come across gifts – in a field just north of Clarendon Gorge I found a styrofoam cooler filled with ice and beer and soda. 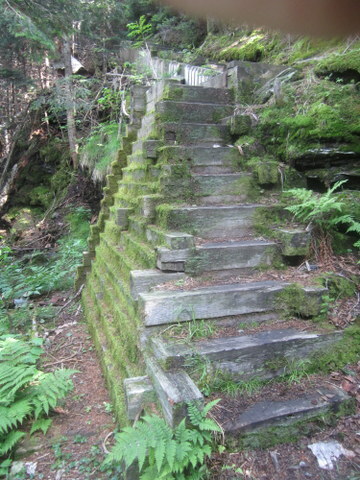 Beer sounded good, but I was about to climb straight up a difficult 500-foot ravine. Did I really want to down a beer? I opted for cream soda — thanks! Other generosities were less successful; at Appalachian Gap (Rte 17) there was another cooler, but the fruit in it had long since gone bad. In possibly one of my lower moments, I left some heavy trash in the cooler, reasoning that whoever put it there would surely come to clean it up. I felt a bit guilty, but getting rid of trash felt like real magic to me, and I left a thank-you note with my name, so at least I would be accepting whatever blame or forgiveness was due. 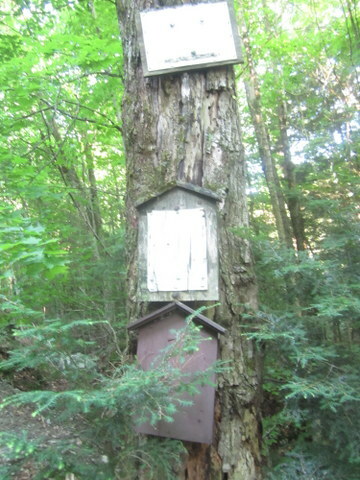 I’m not sure what I think of these anonymous trailside caches. I heard some hikers complaining they hadn’t run across enough of them, as if they were entitled to free handouts. The real magic I experienced was the generosity of those I met who gave me rides, or fed me, or offered other kinds of help, in person. The LT assiduously avoids any sign of civilization: it truly aspires to be a walk in the woods, and on the mountains, from one end to the other. This makes for a challenging walk but in some ways the most difficult part is getting into town for your food. Many of the hikers I met were Vermonters who had family meeting them: bringing food, giving rides into town, or shuttling vehicles around to strategic waypoints. My system of postal drops was designed to hit the towns closest to the trail, so I could walk if I had to, but life was much better if I could hitch a ride. I wasn’t always successful – many, many cars passed by my outstretched thumb – but it only takes one person to stop. I particularly remember Shamus picking me up at one of my lowest moments (I’ve taken the liberty of re-christening him with a trail name that I believe he was given years ago by the subject of his book, “Voelker’s Pond“). I had been lurking around Middlebury Gap for an hour or so on a particularly hot day, trying to get a ride into Ripton. There was no way I was going to walk the 5.6 miles on asphalt down and back up the steeply winding road: I really needed help, and there wasn’t much traffic on this road. I had walked down to the Snow Bowl (Middlebury College’s ski area) to check on a possible bus, but in the summer, it only ran on the weekend, so back up to the top of the gap I went – I had a backup plan that involved sharing a ride with Little Sister’s aunt, and I felt like I should stand near the trail crossing while I thumbed. Just as I was reaching the top again, Shamus pulled over on the far side of the road on his Harley and asked if I needed a ride. My thumbing strategy largely neglected motorcycles, but Shamus seemed relatively unconcerned about the possibility that Vermont might have a helmet law or that we might run afoul of it. I climbed aboard, holding my pack on my lap between us, and silently prayed that Shamus would be a careful rider as we descended the steep mountain highway. I couldn’t have been luckier in fact. He handled the powerful, stable bike with care and went above and beyond anything I could have hoped for as he took me, not only to Ripton, where I enjoyed the cold drink and protein bar he insisted on buying for me, but on to East Middlebury, because tiny Ripton’s little general store had just this year ceased to operate a US post office and had forwarded my package another 5 miles into the valley. There Shamus waited patiently for me while I re-packed, and he then took me back to the top of the gap where I resumed my walk, and he zoomed away, resuming his own peregrinations. During this brief interlude, we discovered a number of shared pasts: Breadloaf, where he had worked for a time and which I had once visited with my writer father, and amazingly, a shared love for the woods, streams and lakes of Michigan’s Upper Peninsula. I got lucky a few other times too, always getting a ride when I really needed it, but I don’t recommend relying on hitchhiking if you have any other options: instead, bring a phone and try calling for a shuttle service or taxi. I didn’t bring my phone, assuming it wouldn’t work anyway and would run out of batteries, but in fact there is good reception from many mountaintops, and I learned that even a smartphone battery will stay charged for 5-6 days if the phone is off. I arrived at the end of the LT at the Canadian border shortly after Moose Hunter on Sunday, June 24 in plenty of time to reach the trailhead by 2:00 where Ellen was actually waiting in the MINI to take us into town to see the World Cup Finals at 3:00. We were already soaked by the heavy rainstorm that started shortly after we reached the terminus and overjoyed to see the car waiting there for us. Me, on the Canadian side of border post #592. Astute observers will note the faint line in the woods on the left, ending in a notch on the horizon. That is the mowed border line stretching away to the west. In all I met only eleven other northbound LT through-hikers, which made for a pretty sparse albeit friendly group. 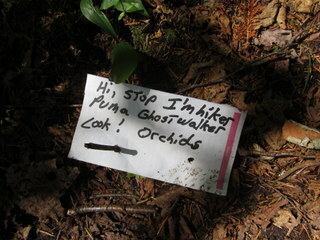 Many of the hikers I met were in between jobs, or retired and thus had more flexible walking schedules. Some folks opted to wait out fogged-in drizzly days, or to spend an extra night in town, so I ended up moving ahead during a few nasty days, climbing both Camel’s Hump and Mansfield in fog and rain. Other hikers (mostly younger men like Waldo and Canadian Matt) were simply going way too fast for me to keep up with. I think everybody basically spent the days alone, and the one time I camped alone (at Skyline Lodge – this was before the caretaker came on duty) was blissfully peaceful, but it was pleasant to share some conversation in camp, and at lunch, especially with others who were undertaking the same struggles. 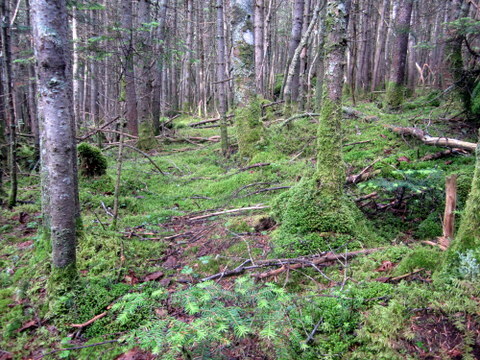 I had been reading Moose Hunter’s log entries in the shelters (here are some she left online), had heard a bit about her from other hikers she had passed by: for example I knew her as the only person to have actually seen a live moose amid the mountains of moose poop, which we all saw. Due to some comments she made in the logs, I had anticipated the possibility of finding her at Spruce Ledge camp, where in fact she was staying when I arrived. We ended up staying at the same shelters for the last few days, and it was nice to be travelling in company again. 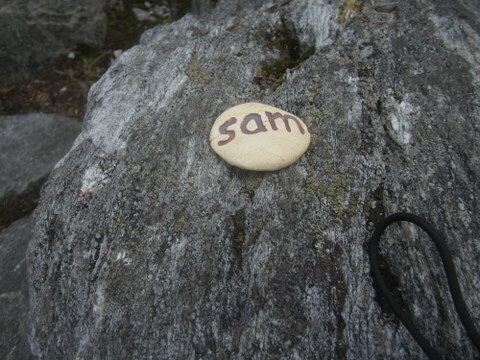 I had been carrying this small stone since picking it up in Jonesville, where Balthazar gave it to me, along with two others, in remembrance of his and Guinevere’s son, Sam, who as I later learned died in a car accident in Florida. I dropped the first of these at a particularly lovely viewpoint on the trail on the way up to Duck Brook shelter since I thought he should have at least some resting place near home, and another one in a pool in Duck Brook since stones and water belong together, and that was probably my favorite brook of the entire trail: it has a lot of water with deep pools and cascades, and is perfect for playing in. Balthazar pulled me in off the trail in Jonesville where it passes his house (although by now it may no longer do so due to the new footbridge across the Winooski River), offered me a shower and coaxed his gracious wife into making me the most delicious breakfast I can remember. Thank you both again! 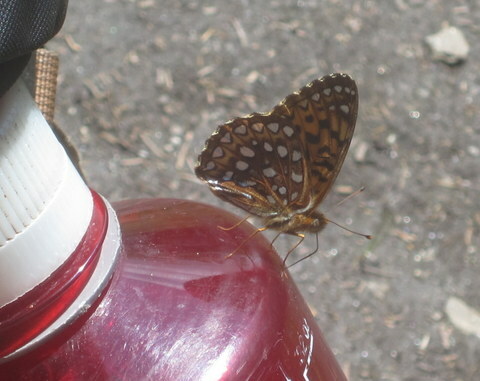 A very friendly butterfly – later it rested on my leg for a while – at Whiteface shelter. somewhere between Corliss and Spruce camps? When people asked me why I chose to do this, my answer went something like: (1) I had three and a half weeks off from work, (2) I had a memory of wanting to hike the LT left from childhood, and (3) I figured if I didn’t do it now I never would. That’s all true, and it’s an explanation of sorts, but I think I also just wanted to see what kind of person I was when detached from family and work. I think many people embark on an extended wilderness trip with ideas of self-discovery or personal growth. Certainly there were physical changes: I lost ten pounds and my calves grew. 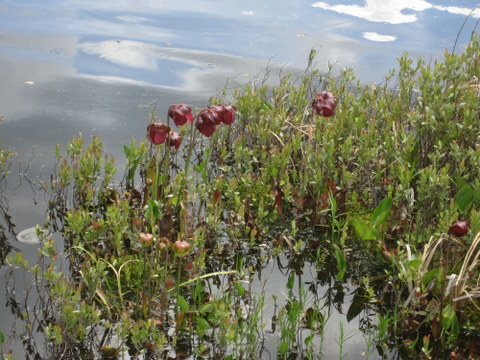 But I know these will be transitory: will there be some more enduring internal change? At this point it’s hard to say. I know now that I can be doggedly persistent and endure a lot, but I knew that pretty well already. One thing that surprised me was the extent to which I needed help from other people, and got it, even on a journey that is at its heart about self-reliance. I feel that I’ve learned a bit about generosity and the essential goodness of other people; I hope I’ll be both more generous myself and more open to offers of help from others. Thanks for this chronicle of your journey. I’m not sure I’ll ever attempt more than a long day’s hike, but I enjoy knowing someone who can do such a trek. 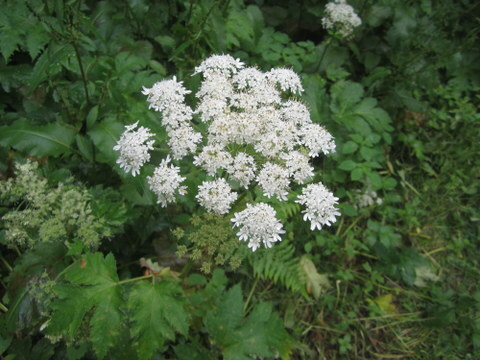 The big spiky leaved white flowering plant might be a type of cow parsley which is common out west. 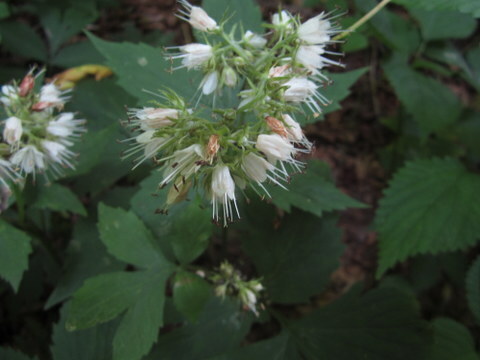 I’m not sure about Vermont flora. Pretty impressive hike, Michael. I remember when you biked across the country many years ago. The names of the LT hikers were like hobo names from the 1930s. Very nice account of your trip. My son, Nick is an avid hiker, rafter, climber, outdoor adventurer, …………….and he will enjoy it as well. It has to take a lot of courage to take on a journey like that on your own! What a luxury to work for a company that allows employees to recharge by providing a sabbatical. What a pity that so many people wait till its too late (physically) to take on a challenge like this. Good for you for having the courage and thanks for sharing. Thanks, Denise! I would highly recommend this hike to your son if he is looking for a long hiking trip. I loved reading your account, Mike, with great photos. They were all interesting and well framed but I particularly enjoyed the butterfly on bottle. I’ve never read Pilgrim’s Progress, but surely will now. I was given it by Aunt Cre one Easter long ago — I know I have it somewhere — and the feeling I ought to read it has been nagging me ever since. I’m glad I’ll be able to share that part of your experience, at least! You’ve inspired me to walk over to get the paper today, or at least consider it, but unfortunately it’s raining! I’ll do that tomorrow.